Wicker’s Mesquite Marinade & Baste (the one with the GREEN label) is hand-crafted in Hornersville, Missouri, USA. Wicker’s Mesquite Marinade & Baste is made by starting with our secret formula of spices in a vinegar base and contains no sugar or oil…then we add a kick of our special Mesquite seasoning to wake up your taste buds. “Hey taste buds! 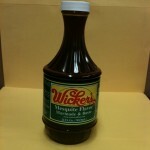 Ready to have some fun?” Wicker’s Mesquite Marinade & Baste tenderizes meat and has a hint of smoky deliciousness. Wicker’s Mesquite Marinade & Baste smells like you’re sitting around a campfire. If you want to pretend you’re camping, but don’t have the time to go, just marinate your chicken, beef, pork, etc. in Wicker’s Mesquite Flavor Marinade & Baste for a taste of the outdoors. Or better yet, use it while actually camping! Wicker’s Mesquite Marinade & Baste is made for both long, slow smoking and quick grilling. Here in the South, barbecue means meat smoked at low temperature for hours until it is mouthwateringly tender. Wicker’s Mesquite Marinade & Baste was created for this purpose. But what if you don’t have “hours”? What if you only have a few minutes to make a healthy dinner? Good news! Wicker’s Mesquite Marinade & Baste is also made for marinating meats for grilling over high temperatures for a short time period. It is perfectly suited to both disciplines. So, whether you have hours or minutes, Wicker’s Mesquite Marinade & Baste will make everyone’s mouth water. Easy cooking tip: Put your chicken or beef in a ziplock bag in the morning, pour in enough Wicker’s to cover the meat, zip it up & put it in the fridge. Throw it on the grill when it’s dinner time. Bonus! On a special diet? Wicker’s Mesquite Marinade & Baste is friendly to diet plans that limit the intake of carbohydrates, such as the Paleo Diet, Caveman Diet, South Beach Diet, Adkins Diet, etc.